Sometimes, you crave something and nothing, nothing, nothing in the world will be right until it is yours. Sometimes, you forget about something you once adored, only to re-discover it and love it even more. Sometimes, you have something to prove, but only to yourself, and you won’t be satisfied until you prove yourself right. And, sometimes, you become obsessed with something and can’t imagine life before it was in yours. In order from top to bottom: salt and chocolate, my pistachio KitchenAid stand mixer, the ability to make shortbread, and walnuts. Much to my palate’s and my ego’s delight, these factors collided in happy harmony, the results of which were these Salted Chocolate & Walnut Shortbread cookies. I’ve been on a salt kick recently. 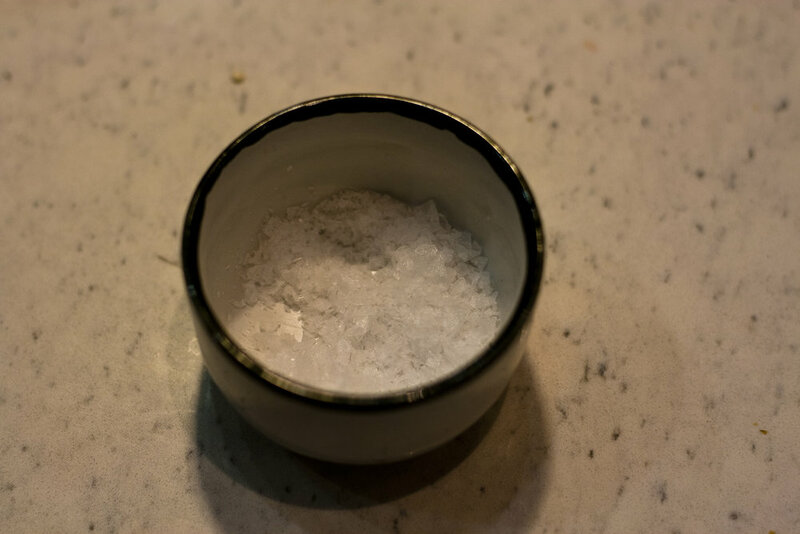 Not just any salt – Maldon salt. I first read about it in Bon Appetit, and then tasted it at Chewse, where we sprinkle it generously on buttered bread, simple salads, dark chocolate, et al. The crispy pyramids are flaky, crunchy, and mild – the perfect finishing touch to just about any food I can imagine. After buying a box of my own and flaunting the stuff in its own little finishing salt dish, I’ve periodically forced everyone who has entered my kitchen to try a pyramid out for taste. My KitchenAid mixer, a shiny beacon of pistachio goodness, was gifted to me by my lovely grandmother, when I moved into my first big girl apartment. After playing with my new toy (much to my friends’ delight) day and night, I did what most kids do, leaving it to collect dust and take up space on the counter. It moved with me to my next Boston apartment, where it collected more dust, and was eventually packed up and shipped home, across the country. Waiting in line at Tartine is a rite of passage every San Franciscan must endure. The delightful scents of churning butter, baking bread, and sugar on sugar on sugar waft out onto the street, where ravenous hipsters and tourists alike wrap around the block like pastry-jonesing ducks in a row. After waiting in said line for longer than I’d care to admit, we collected our earnings (a medley of shortbread cookies and chocolate mousse things) and absconded to Dolores Park like the “good hipsters” we are. I’m glad we went, but the honest to goodness truth was that I thought I could’ve done better. For all you Tartine fans out there, I know this is big talk! Maybe we ordered the wrong stuff – they were out of Pan de Chocolate, okay?! – or, maybe I’m an only child with an inflated ego and nothing to lose, but I was determined to make shortbread cookies worthy of such a tremendous wait. The final piece to the puzzle is walnuts. Walnuts are good. This I knew and have always known. But, only recently did I really really fall for their crunchy, buttery, earthy goodness. In my book, walnuts belong in my oatmeal, in a jar on my desk, on my salad, in my pasta, and now, all up in my dessert. I hereby sanction a recall of the phrase “icing on the cake” in exchange for “walnut in the cookie.” Make these Salted Chocolate & Walnut Shortbread cookies and you’ll know what I mean. Well, I’m proud to admit that these cookies turned out great. They’re not too sweet and just salty enough. The little Maldon pyramids sprinkled on top have the slightest little crunch. The butter packed cookies have that satisfying shortbread break with each bite, but just enough give to fold around a spoonful of ice cream for DIY ice cream sandwiches. And, the good news is, I made these with my eyes half closed! No seriously, I’m not bragging here. They’re so easy to make that I actually managed to do so before work! Let it be known that I am not a do-anything-before-work person. No running, no errands, and certainly no baking. But I’m telling ya, these cookies are so easy and quick to make you’ll actually want to wake up a few minutes before the sun just knowing that their salted walnuty chocolate goodness is in your future. In a medium size mixing bowl, combine flour, cocoa, and baking soda. In another medium size mixing bowl, combine brown and granulated sugars. 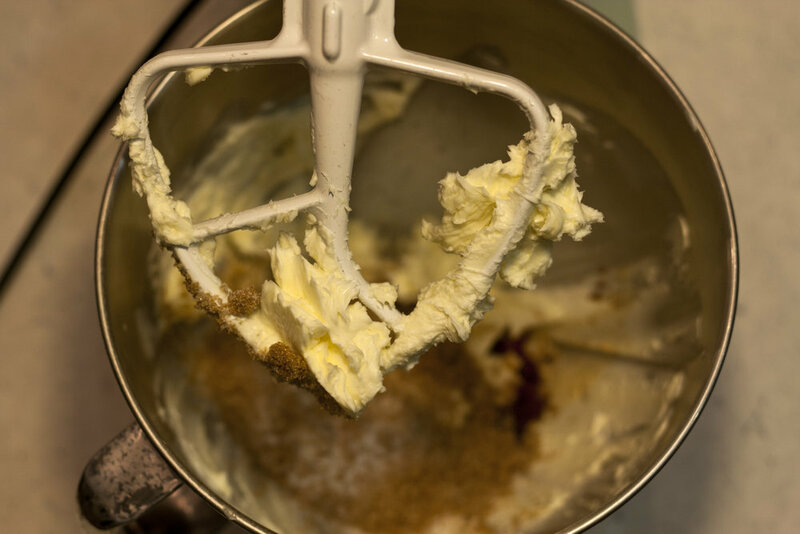 Use a hand or stand mixer to cream the butter in a large mixing bowl for about two minutes. Add the sugars and vanilla and mix on medium speed for about two minutes more. Pour in the dry ingredients. Turn the mixer on low in five-second intervals. Pulse like this five times, then turn the mixer on low for about 30 seconds, or until the dough has formed. Add in the chopped walnuts and salt and mix to combine. Unwrap the logs and use a sharp knife to cut each log into ¼ inch thick slices. Place slices a few inches apart on a parchment paper or silicon pad lined baking sheet. Sprinkle with Maldon salt. Bake the cookies for 12-15 minutes. Cookies should still feel soft when you take them out of the oven. Let rest for a couple minutes, and then transfer to a cooling rack.